Right off, I'll admit that much of the Central Asian music I've spent time with is from the tiny nation of Tuva, renowned for its cowboys and throat-singers. Some great instrumentalists too, of course, but hey...that throat-singing thing is pretty catchy. Also, it's fairly rare even in global-music circles to see new music from Tajik, Ughur, or Hui musicians. For some reason, Bob Brozman, Taj Mahal, and Paul Simon seem to have overlooked the collaborative possibilities in this part of the world. But not Wu Man. Which brings us to today's album of choice. 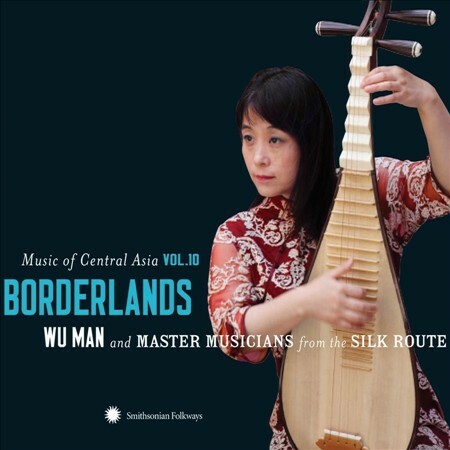 The 10th offering in a stunning series from Smithsonian Folkways, Borderlands includes a 14-track audio CD, a well-designed and informative booklet, and a DVD with background and outtakes on the meetings and collaborations between Wu Man and her new Central Asian friends. 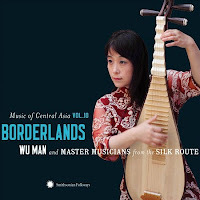 In an unprecedented collaboration, Chinese pipa master Wu Man unites the historical Central Asian roots of her instrument with Uyghur, Tajik, and Hui master musicians. Featuring the stirring vocals of Sanubar Tursun and Abdulla Majnun along with newly arranged and composed instrumental pieces, Borderlands is a masterful blending of kindred traditions. One of the things I love about good collaboration stories is the way the visiting musician(s) must put their ego on the shelf and really open up to new sounds and structures. Wu Man does this here, showing humility and even frustration in trying to work out arrangements. Perhaps the biggest handful is Abdulla Majnun, from the desert town of Khotan, who took refuge from the Cultural Revolution with an order of religious beggars and went on to invent the diltar, a double-necked lute that can be both plucked and strummed. The other thing I love? Just listening to master musicians work together. As on this traditional festival tune played by Wu Man and Abdulla Majnun (on dutar this time). It's based on a festival tune with improvised lyrics. great tune! thx for recommend this!